Over one hundred years ago, researchers demonstrated that calorie restriction in rats increased lifespan, sometimes by as much as 50 percent. Since that time, the finding has been replicated and extended to primates. A few humans have taken up the diet but for most of us easy access to delicious food trumps willpower. A new paper in Science reviews the literature on calorie restriction and also offers some evidence that less restrictive regimes such as intermittent fasting may have similar effects. In humans, short-term trials such as the multicenter CALERIE (Comprehensive Assessment of Long-Term Effects of Reducing Intake of Energy) study (26–29), the observational studies of centenarians residing in Okinawa who have been exposed to CR for most of their lives (30), and observations of the members of the Calorie Restriction Society (CRONies) who self-impose CR (31) have shown the occurrence of many of the same physiological, metabolic, and molecular benefits typically associated with long-lived animals on CR. These studies support the observation that long-term CR preserves a more youthful functionality by improving several markers of health, including decreases in body weight, metabolic rate, and oxidative damage (14); lower incidence of cardiovascular disease (31) and cancer; and decreased activity of the insulin-Akt-FOXO signaling pathway (32, 33). Although these findings clearly indicate that a reduction of caloric intake could be an effective intervention to improve health and prevent disease during aging in humans, there are several obstacles [including safety concerns and lack of data in older populations] and…The current “obesogenic” social environment makes it difficult for individuals to adhere to strict dietary regimens and lifestyle modifications for long periods of time. 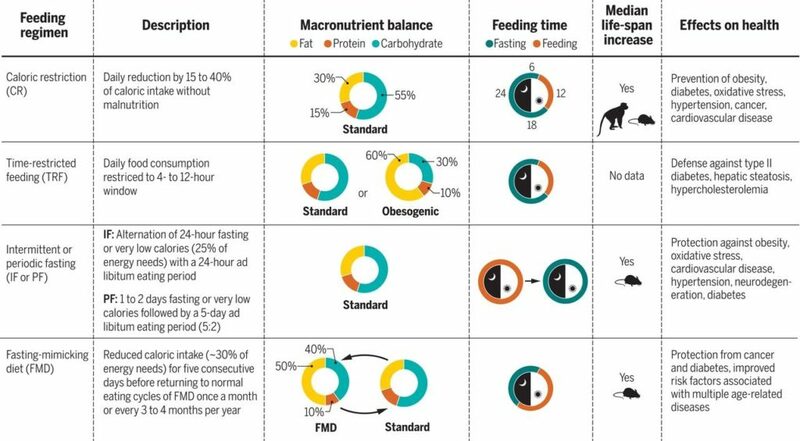 Thus, there is interest in alternative feeding regimens that may recapitulate at least some of the beneficial effects of CR by controlling feeding-fasting patterns with little or no reduction in caloric intake. So what else works? Three regimes have shown promise. 1) Time Restricted Feeding (TRF), i.e. limiting eating time to a 4-12 period during the day and preferably earlier in the day, 2) Intermittent Fasting (IF)–say a 24-hour period of 1/4 calorie consumption once or twice a week; and 3) a Fasting Mimicking Diet (FMD) in which calories are restricted to 30 percent of normal with a higher proportion coming from fat and doing this for five days periodically, i.e. once a month to once every couple of months. The diagram presents the main results and evidence (click to enlarge).